2. The next major innovation in the setting of type did not come along until over four hundred years later with the invention of the Linotype machine in 1884. These line casting machines did what they said on the tin- they produced an entire line of type by casting individual type together. These lines of type became known as slugs. Once the page has been printed, the slugs are melted down and re-cast again. Until the invention of this machine no newspaper in the world was longer the 8 pages so it revolutionised the form and volume that news was presented in. 3. 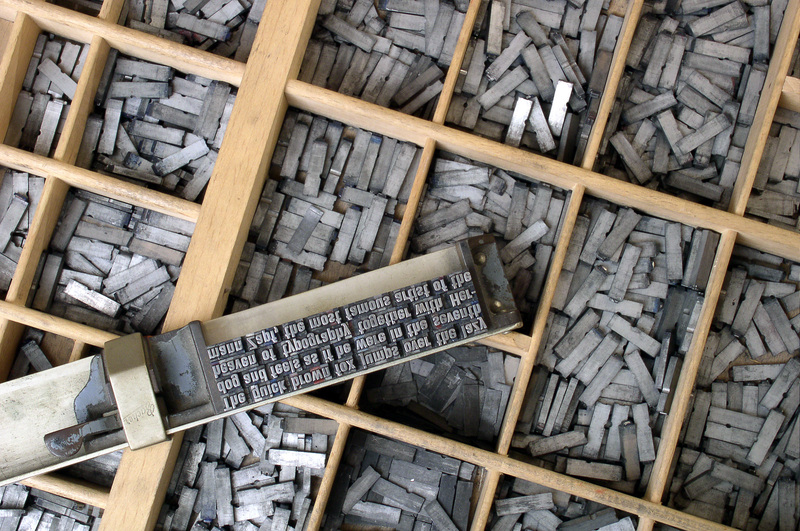 Typeface for letter press printing were kept in typecaces- shelves with seprate compartments. There were shelves and shelves in any one print shop so they had to be kept tidy. Capital letters were kept in the upper case and smaller letters were kept in lower cases hence our names today of upper case and lower case for letters. It was very difficult when working quickly to keep the ‘p’ and ‘q’ types in order in their section in each case. Supposedly the phrase ‘mind your ‘p’s and ‘q’s’ came from early print shops. 4. The bollards outside the barracks are real cannons turned upside down! A friend told me this but I couldn’t quite believe it. The true nerd in my shone through and it was one of the first things I checked when I started. 5. Print shops were very loud places to work. The museum runs demonstration days when all of the printers are up and running and they are incredibly noisy machines! How anyone could hear after forty years of working in one of these places amazes me. There is also a reason most printers had glasses. I held an actual typeface of a size 12 font the other day and it is small. Added to this compositors would assemble the type upside down and of course the type has to be read backwards. In large warehouses that were not always well light compositors had to have excellent eyesight. There is a really nice clip of a Gutenburg press demonstration at the International Printing Museum in Carson California here. This entry was posted on 7 December 2011 at 08:30 and is filed under Uncategorized. You can follow any responses to this entry through the RSS 2.0 feed. You can leave a response, or trackback from your own site. The Print Museum is magnificent and well worth a visit. Congratulations on the new job. I’d add one other note to the effect that the printing press had on society. It contributed to the notion of standardized spellings, in order to speed up typesetting. The invention of the typewriter some 400 years later had a similar impact, for the same reasons, though the idea of standardized spellings was very slow to find acceptance. I’ve seen a Feb. 4, 1882, article in The Intelligencer newspaper of Wheeling, West Virginia, concerning its appeal to the West Virginia Press Association to form a committee “to agree upon a certain number of amended words to be used by all papers in this State, lists of which shall be hung up in each office for the information and guidance of composers and proof readers … First reform the newspaper spelling, and next will follow a school book … Thus, gradually, the English language will conform its letters to their true relation to sound. ” The Chicago Tribune was another newspaper pushing the idea, but others – including the Washington, Pennsylvania, Examiner – ridiculed the idea. Now, of course, Twitter is undoing much of the progress that has been made, but dear old Gutenberg’s invention nudged us in the right direction. Another interesting thing about Beggar’s Bush Barracks is that it was the HQ of the Free State Army during the Civil War. Erskine Childers was executed by firing squad within the barracks in 1922. I don’t know where exactly, but would be interested in finding out. I too love the Print Museum, one of my favourite places in Dublin. Good luck with the new job, Lisa. This was an excellent post, and it inspired me to write some of my own thoughts about the Print Museum. Gerald- thank you so much for those additions, they are really interesting. Felix- many thanks. I hope to catch up the next time you are out at the museum. Scarndt- glad I got you posting. Thanks for sharing your thoughts. I was walking around the Macedonian city of Ohrid last year and stumbled into this workshop. They have one of only two working replicas of the Gutenberg Press in Europe. If you’re ever in the Balkans, this is well worth going to see. Thanks so much for that. I will share it with my class.